Heat oven to 350°F. Spray 9-inch round (2-quart) glass baking dish with cooking spray. In small bowl, mix 1/2 cup cookie mix and 1/2 cup sugar. 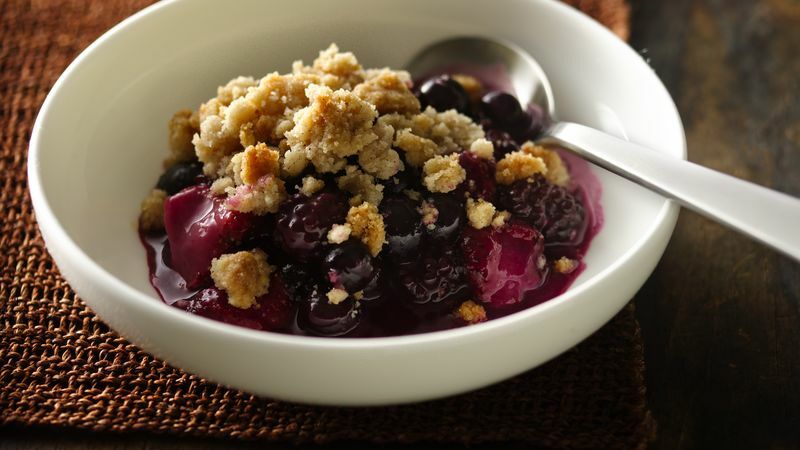 In large bowl, toss together strawberries, blackberries and blueberries. Sprinkle with cookie mix-sugar mixture. Toss gently until berries are well coated. Place fruit mixture in baking dish. In medium bowl, mix together remaining cookie mix and cinnamon. Using pastry blender or fork, cut butter into cookie mix until mixture is crumbly. Sprinkle evenly over fruit. Bake 35 to 40 minutes or until topping is golden brown and fruit is bubbly. Serve warm or room temperature. Serve-With Serve with ice cream or whipped cream.